On September 3, 2012, an agreement of cooperation signed between the University of Ioannina (PI) and Labriadeios Foundation. 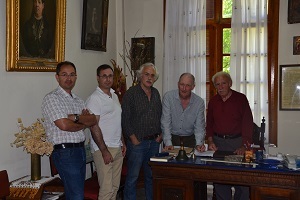 The agreement relates to the Labriadeios building in Ano Pedina, Zagori, which housed the Labriadeios Housekeeping School for 27 years, which closed in 2006. The aim of the new agreement was to host research and teaching activities by functioning as the field Research Station for the University of Ioannina. The use of this property was granted for 25 years. In 2013 the Board of the new academic unit decided to give it the name PALASE (University of Ioannina - Labriadios Research Station). As part of this cooperation, the July 1, 2014, became the concession of use for 25 years.